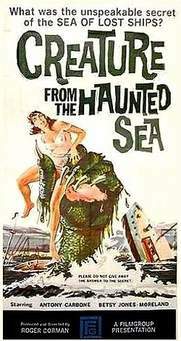 Our first film is Creature from the Haunted Sea, a 1961 beaut from Roger Corman. In Cuba, Castro has just successfully led a revolution, ousting dictator Batista. But just because they won, doesn’t mean the Revolution has any money. So, an American casino owner, Renzo Capetto, is asked to smuggle a giant box of gold out of Cuba for Castro (I’m not really clear on why, but whatever.) Capetto agrees, but only because he plans to steal it for himself. In on the job are his gal, Mary-Belle and her brother, Happy, Jack (the guy who makes animal noises,) and Sparks (who’s actually an undercover American Agent.) General Tostada, his aide, and a bunch of Cuban soldiers are accompanying the gold so nothing happens to it on the way. 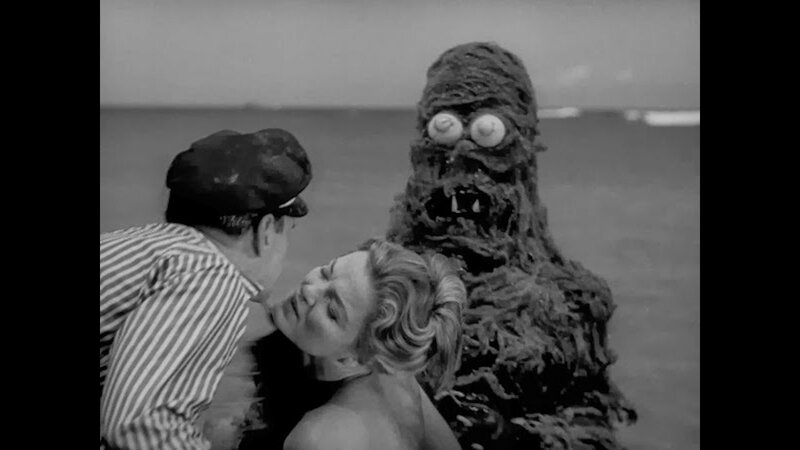 Capetto decides to kill as many of the Cubans as he can on the boat ride out of Dodge, so decides to use a local legend about a sea monster as cover. Trouble is....the monster is actually REAL! So, while Capetto does murder a handful of men, the monster gets the rest. Naturally, the crew members turn on each other, which just makes it easier for the monster to kill them. The American agent is the only survivor and the monster keeps the gold, presumably to fund his dream of opening an underwater bed and breakfast. Like I said earlier, because these films are so short, it’s easier to explain the plot than act it out. The narrator did most of the talking (the American agent) but a lot was done by the other characters, as well. I think what irked me the most was the randomness of character’s backstories. Like they just wanted everything to be so obviously silly to fit in with the humor, but it just made it look like they tried a little too hard. The acting isn’t super bad. Since this is also a comedy, the absolutely goofiness of the jokes kinda fits the time period and as such, the acting didn’t seem out of place or too awkward. Wasn’t great, but I’ve seen much worse. The monster was a total joke. That could have been on purpose as most elements of this film seem like parodies on other genre film aspects. And sometimes, the absolute ridiculousness of the creature is what makes it fun. I did laugh every time this thing appeared on screen. Overall, it’s just a silly creature feature that’s not terrible to have as background noise if you’re doing something else. Doesn’t really deserve your full attention, but I won't judge you for watching it. Four dead planets have exploded in short succession. Before the fifth one does, Dr. Zarkov figures out that a bomb, made of a certain nuclear material that takes 100 years to blow, was planted on each planet. He, Flash, and Dale must travel back to 1953 Earth and stop the German mad man who has created the bombs. I’m not sure if the episode got cut off or wasn’t recorded properly, but it ends just before our heroes begin to travel back in time. No wrap up or “stay tuned for the exciting conclusion” or anything. It’s only about 10 minutes long so it’s hard to say much except the acting is pretty bad, the quality of the recording is terrible, and I’m not a big Flash Gordon fan anyway, so I didn’t really care what was going on. There was only one season of this live action television show so that might tell you a bit about the appeal/quality of it. UPDATE: Found the whole episode on YouTube while looking for a trailer so feel free to watch the whole darn thing on your own time! 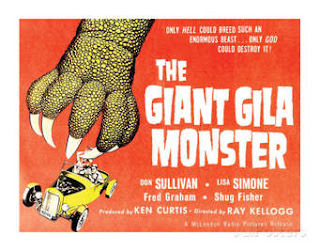 My last flick is about the absolute possibility that a Gila monster (yes, those black and orange venomous lizards) can live in such seclusion as to grow nearly as big as Godzilla and NO ONE NOTICES. After a bunch of people go missing, the small-town sheriff stumbles upon information about the Gila monster and how that’s as good an explanation as anything so let’s run with it. He and Chase Winstead, local good-guy teenager just trying to save up money for his sister’s leg braces, work together, with explosive results, to end the monster’s rampage. The acting is a touch better in this, compared to the water-carpet monster movie. The characters are more likable - sheriff is actually a good guy, Chase is a teenage,r but one of those kinds that has a good head on his shoulders. While I don’t like the “missing boy’s dad is rich so he’s a total asshat” and the “missing girl’s parents are poor so they’re kind and lovely people” stereotypes, or the obvious foreshadowing (I mean, honestly, who transports cans of nitro glycerin around? ), or the bad sound effects, or the popular Captain Morgan knee-up stances everywhere...the movie wasn’t THAT bad. Aside from the odd Flash Gordon episode throw in the middle, these flicks were decent pieces of sci-fi fluff. Not interesting or well done enough to demand one’s total attention, but they’re fun enough to be slightly entertaining. And sometimes that’s all we want or need - to just be slightly entertained. 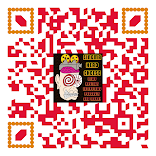 Get books, comics, graphic novels and more at bunny17media.com. Use the code CHC at checkout for 15% off your purchase!